Jackpot! We’ve met Sci-fi Man and he is more spectacular than we’d thought. Instead I sat quietly as he asked me if I liked science fiction. I let him get his whole speech out. I was filled with a strange joy that, after hearing about other people experiencing this, it was actually happening to me. What issued forth from me in response was a pathetic, “yah”. That pleased him enough and we got him talking. We talked for over two hours about everything – Oom furiously scribbling down notes all the while (good thing he took that summer course on secretarial short hand). Sci-fi man’s name is Stewart Lennox. He claims to come from some lake place in the northern part of England. The man has ideas and stories that are so fantastical he should be a sci-fi writer. Thing is, he totally believes all these stories. And what’s spooky is that he too believes in a sort of Bermuda Triangle type zone of Salt Lake City in roughly the same area that Oom and I have mapped out for one inside the area of town known as The Void. He lives in the heart of it - not far from Weedpatch. Mr. Sci-fi leaned in towards Oom and me and in hushed tones began to tell a spooky tale about large black wasps that live unnaturally together in a nest in his backyard. The wasps transform into scary phantom ladies and go off gliding around the city doing who knows what. The ladies are tall – six footers. 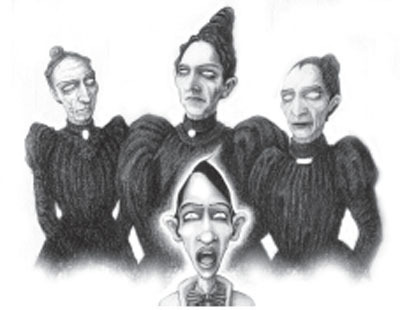 They are sternly dressed entirely in black Victorian era dresses. Their hair is black and pulled tightly back into buns. The skin on these ladies is grey and looks as though it could be water soluble. The lips are thin and parted slightly to allow for the raspy mouth breathing. The hissing sound of a leaking tire with occasional static crackle accompanies the spooks, and the aroma that comes with them is soured milk. The most unnerving thing about the ladies is their eyes. The eyes are grayed out with very little definition as if from a long-exposure photograph in which the sitter moved her eyes. As Sci-fi man was describing the phantoms, we heard an eerie high pitched whistle with a slight vibrato. It was like mood music to a horror film. I glanced up at Oom whose face was purple and strained. As soon as I locked eyes with him, he erupted with the loudest hurricane-force fart I’ve ever heard. The poor guy had been trying so hard to keep in that fart that it had caused the effect of pinching apart the end of a full balloon to let the air out in that loud squeaky noise. He failed spectacularly, and in the relative silence of the library, everybody heard it loud and clear. Sci-fi man turned to Oom and stared coldly at him. That set me off and I started wailing with laughter – loudly like a banshee – like crying. Tears streamed down my face. It was difficult to catch a breath but when I could, it was a loud, hoarse inhalation of air. A librarian came running to see if I was alright. She thought I’d been injured in an explosion. Through my laughter I could hear Oom trying to explain the situation to the librarian and calm her down. At the same time I could hear the appalled British sensibilities of Mr.Sci-fi saying, “Young lady! Boudica! this is NOT the place. Do not encourage him”. While I struggled to get myself under control, Oom, with his face now red with embarrassment, apologized and started to tell Sci-fi man about our files. He asked Sci-fi if he’d be interested in writing down this phantom wasp lady story in his own words and submit it to our collection. To our surprise and without hesitation, sci-fi man replied, “certainly”.